All performers are listed alphabetically. 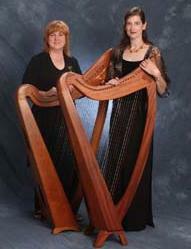 The harpists on this page are not affiliated with Classic Harps Northwest. Please contact them directly for more information and booking possibilities. Karen Almquist is a harpist and soprano performing for all occasions: weddings, funerals, receptions, corporate or private parties. She's recorded three CD's with flutist Jennifer Grady. 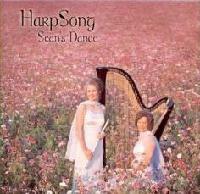 The duo is known as HarpSong. Their CD's, "Noel", "Sean's Dance" and "The River" are available at Classic Harps NW. She prefers gigs in the Greater Willamette Valley and you can contact her by phone (503) 873-3175 or e-mail karenalmquist@frontier.com. Passionate about sharing the beauty of the harp with others, Allegra Bel has been enchanting audiences with her harp music since 2004. She has enthusiastically performed at numerous venues across the United States, including weddings, receptions, church services, funerals, school programs, private parties and corporate events. She is privileged to have studied under the private instruction of several different harpists, including world-renowned Dr. Carrol McLaughlin at the University of Arizona and Dr. Cathy Clayton at the University of Utah. Allegra Bel would be delighted to bring a touch of elegance to your special occasion. For more information, please visit www.LaBellaHarp.com or call (541) 525-0332.
engagements or lessons in the Portland area, contact her through her website at www.carolebellinger.com. 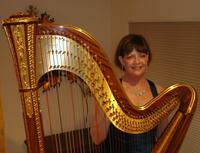 Janna Bisceglia Engell has been performing harp at weddings and other special events for over a decade. Janna plays both the Celtic harp and the Classical harp and her repertoire includes Celtic, classical, contemporary and traditional music. As the two-time northwest Scottish Harp Champion, Janna plays with warmth and grace, and can add affordable elegance to any event! She can be contacted through her website engellharp.com. Celtic Muse's extensive repertoire includes ancient aires and ballads, sprightly dances, stately medieval and Renaissance pieces, and light classics. Allow Celtic Muse to craft your own unique and unforgettable concert, ceremony or party with the angelic voices of harps, woven skillfully with Finnish kantele, sweet flute and recorder. Celtic Muse is available at reasonable hourly rates or as a wedding performance package. Period dress is available for your historical-themed events. Available options include: Medieval, Ancient Scottish, Scandinavian, Prairie and Victorian dress. Contact Valerie Blessley at (360) 576-8111 or blesses@pacifier.com or Jennifer Pratt-Walter at (360) 693-4715 or lyrica@comcast.net to schedule Celtic Muse as part of your special event in the Vancouver, WA and Portland, OR area. Call to ask about our travel options if you live outside of the Vancouver/Portland area. Leigh Brown has been a professional freelance harpist who has been playing for over 22 years as a soloist, in ensemble and in orchestra in Oregon, Indiana, Maryland, and Washington D.C. She plays anywhere from classical to contemporary to pop and jazz music for weddings, private parties, business functions, dinner parties, wine events and culinary events. Currently, she is based in Oregon and enjoys making every occasion special by setting the perfect mood. Please visit her website at www.leighbrownharp.com or email llbrown95@yahoo.com. Elaine Hesselman attended U.S.C. on a four year harp scholarship.Raised in Southern California, she was a student of three prominent studio harpists, Aida Mulieri, Dorthy Remsen, and Catherine Gothoffer. Elaine was harpist with the Pasadena, San Jose, Montery, and Santa Cruz Symphony orchestras, and also member and soloist with the popular Ray Conniff Orchestra. Elaine received her Masters Degree in harp performance at the California Institute of the Arts prior to relocating to Oregon in 1975. She has been a harpist with Portland Opera, Oregon Symphony, Chamber Music Northwest, and the Oregon Coast and Sunriver Music Festivals. 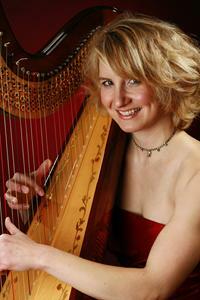 She presently is principal harpist for the Vancouver and Columbia Symphony Orchestras. She teaches in her home studio in Lake Oswego and at Lewis and Clark College. Kimberly Houser holds a DMA in Music from the University of Arizona. She is professionally experienced as an orchestral player and soloist. She is also experienced in Opera, Ballet, Choral, and Chamber ensembles. Kimberly has stretched her skills to include Jazz, Popular and Experimental music. She has also served on the faculties of Louisana State University, Baton Rouge Community College, Clark Community College, and MSU Bozeman, MT, and has been an instructor at the New Orleans Jazz and Pop Harp Weekend, a summer seminar for harpists looking to explore Jazz and Popular Genres. Kimberly is also available for weddings and other events. Kimberly is active as a composer as well as a performer. She has studied harp with Marion Fouse and Carrol McLaughlin and has participated in master classes abroad with Catherine Michel. She studied composition with Pamela Decker. Elizabeth Nicholson performs Celtic harp and vocals for all occasions, (weddings, funerals, ceili dances, festivals, house concerts, therapeutic music, interactive workshops, and more). Her primary specialty is in traditional Irish and Scottish music, though her harp studies have ranged through myriad other world folk genres, from traditional Paraguayan harp to American county blues. A classically trained player with a background in pedal harp, she also plays classical and baroque material arranged for Celtic harp. Elizabeth performs solo and with several ensembles, including the critically acclaimed Celtic/world music band Stringed Migration (www.stringedmigration.com). 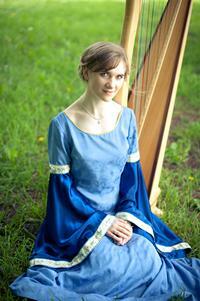 Award winning harpist Kate Petak has been performing for audiences since the age of thirteen. She has received critical acclaim for performances in orchestras, chamber ensembles, and as a soloist throughout the United States, England, and Japan. Areas of special interest include modern music, opera, and small ensembles. She has studied at Boston University, the Royal College of Music, and Ball State University, where she obtained a master's degree in harp performance. 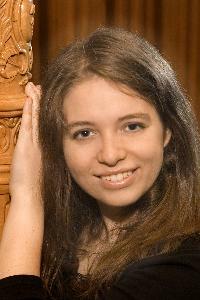 She is interested in sharing her music with the public by performing solo recitals, chamber music, and in orchestras. Kate can be reached by phone at 503-705-9560, by email at kate.petak@gmail.com, or through her website, www.katepetak.com. In addition to performing with Valerie Blessley as Celtic Muse, I provide music at the bedside for the dying, or for those with pain, memory loss and anxiety issues. Jennifer Pratt-Walter, (360) 693-4715, lyrica@comcast.net. Matthew is currently Principal Harpist with Portland Opera, Oregon Ballet Theater, Colorado Springs Philharmonic, and Boise Philharmonic. 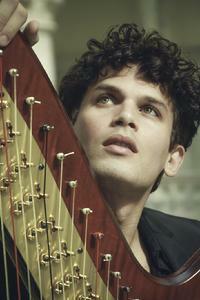 He was previously Acting Principal Harpist with the Utah Symphony/Utah Opera for the 2013-2014 season. Matthew is an avid traveler working as a permanent substitute harpist with Seattle Symphony, Utah Symphony/Utah Opera, Oregon Symphony, Spokane Symphony, Grand Teton Music Festival, Lakes Area Music Festival, Louisiana Philharmonic Orchestra, Billings Symphony, Chamber Orchestra of the Springs, and Anchorage Symphony. He is a graduate of Manhattan School of Music and Juilliard’s Pre College. Matthew has performed in top concert venues such as Carnegie Hall and Lincoln Center. He has performed with James Taylor, Ben Folds, Kristin Chenoweth, The Mormon Tabernacle Choir, Johnny Mathis, Emmanuel Pahud, and other leading musical icons. As a member of the American Harp Society and Vice-President of the Boise Chapter, he gave honorarium recitals with Connecticut Chapter of the American Harp Society and Lyon & Healy West. Matthew participated in a premier of John Luther Adams’ “Become Desert” with Seattle Symphony and joined them on tour with this work. Matthew has performed concertos with Utah Symphony, Boise Philharmonic, Boise Baroque Orchestra, Chamber Music of the Springs in Colorado, and Nova Chamber Music Series. He received a perfect score for a grant from the Idaho Commission on the Arts in 2012. He has recorded with Seattle Symphony and Utah Symphony. Matthew holds University teaching posts as Adjunct Professor of Harp with University of Portland and Reed College. He previously held teaching posts with Weber State University, Northwest Nazarene University. In addition to classical training, he is also a therapeutic harp practitioner, finishing his training from International Harp Therapy. Matthew is based in Portland, OR. You can reach Matthew by phone (203.606.4489) or email (matthewtutsky@gmail.com). Laura Zaerr teaches both pedal harp and folk harp at the University of Oregon, where she obtained her bachelor�s degree in music performance and composition. She was a three-time recipient of the Ruth Lorraine Close Award for musical studies. 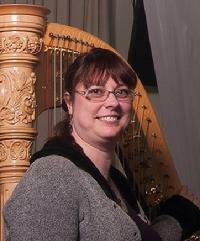 She holds a master�s degree in harp performance from the Eastman School of Music, where she studied with Eileen Malone. Over the past 20 years Laura has produced several solo CDs featuring original compositions and arrangements of Celtic tunes as well as recording collaboratively with various musical groups. Laura�s artistic interests extend beyond performance. With the help of her father, she renovated a single-action pedal harp built in Paris in 1892. Laura�s exquisite performances of little-known classical harp works on this unique and beautiful instrument has gained national attention. As well as maintaining a thriving studio in Corvallis, Laura travels throughout the Northwest giving workshops and concerts. In her spare time she enjoys white-water kayaking. You can reach Laura at lauraz@peak.org or through her website laurazaerr.com. Below is a list of student performers. 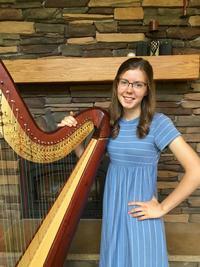 Maya is a two-time Poe harp scholarship recipient and an OMEA adjudicated student harpist. She has been learning and performing on the harp since 2011. She started learning violin and piano at the age of 5 and then switched to harp after listening to a harpist. Since then she has dedicated herself to learning and performing on the harp. Currently Maya is a student at Westview High School and is eager to perform at your special event: Christmas, dinner, tea, brunch, church or any other event where you want beautiful, graceful music by someone who enjoys playing for her audience. Wherever she has played, she has received accolades for her ability, dedication and grace. She can be reached at 503-545-8723 or by email at mayabedgeharpist@gmail.com. Thank you! Emma has been playing the harp for seven years. 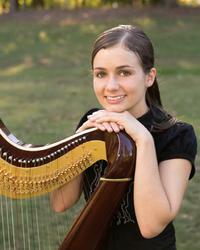 She has recently enjoyed playing the pedal harp with the Metropolitan Youth Symphony in Portland. She loves playing all kinds of music from Celtic to classical. She is currently in high school, and plans on continuing her musical education. She has to studied with wonderful teachers who have helped her develop her playing skills. Emma has experience playing for audiences and would be happy to play for holidays, weddings, parties, church, casual gatherings or any other special occasion. You can contact her at (503) 839-2227 or email emmagcouch@gmail.com.